I know everyone is probably really sick of seeing all the same prints, but this one is still my favorite! 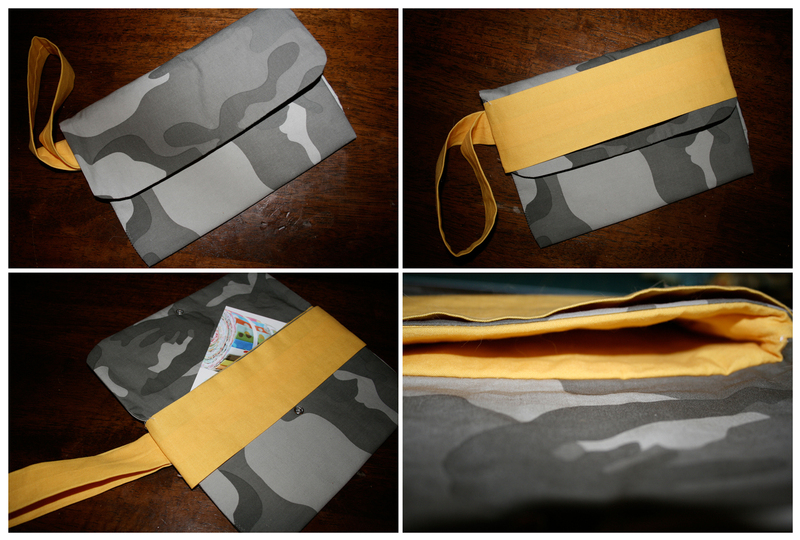 I loved the clutch I made Mitzi and wanted to make one that was reversible. At the time, I didn’t know how to do that, but I have since learned! It’s a bit tough, but worth it in the end. Since I don’t have too many good clasp/button options laying around at the moment, I thought about other ways to close the purse. I decided to design this little wrap element which I really love! The best way to keep that working for both sides is to sew magnets into the fabric of the strap, that way it stays functional when reversed. I didn’t have magnets but was itching to sew out my design, so thought I’d just make it anyway. Here is the finished product! The first two images on the left are of the front sides, and the last two on the right are of the back sides. The middle pics show you what it looks like open and some stitching close up. Remember you can click the image to enlarge! And just because I think it’s funny looking, I will post what I made last night. Originally before deciding on the wrap around clasp, I thought it would look cool to make a wristlet with a strap across it to tuck the top into. Once I completed the project, I realized it looked like a Teenage Mutant Ninja Turtle. Either that or a blindfolded soldier. I’m not sure how anyone could possibly make a wristlet that looks like a ninja turtle, but somehow I did. If any girls are planning to be a TMNJ for Halloween this year, let me know.. you will have a purse to take along! I attempted to see what it would look like without the top tucked in, and I think that looks better. Regardless, I will probably not be using this wristlet. It was poorly made, and stupid, however it was definitely good practice for tonights clutch which I think turned out really well. This entry was posted on February 23, 2010. It was filed under Bags, Sewing.